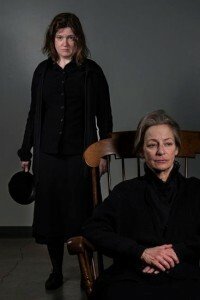 Sally Wingert (left) and Amber Bjork in Theatre Pro Rata/Park Square Theatre’s production of The Beauty Queen of Leenane. Photo credit by Charles Gorrill. Some reviews of less-known plays start with a synopsis of the work. 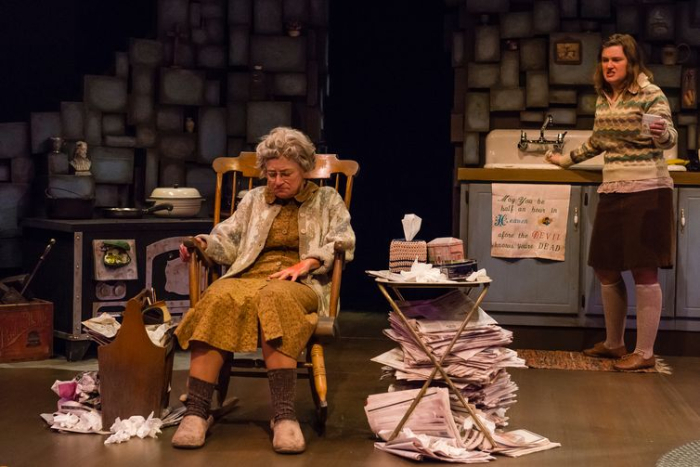 Doing so for The Beauty Queen of Leenane (now playing at Park Square Theatre) would be counterproductive to theatergoers, since the best part of seeing this play is wondering who is actually telling the truth and what is really going on. Suffice it to say that this black comedy of a piece is set in rural Ireland and staged with brutal realism by director Carin Bratlie Wethern. It certainly fits with the mandate for gutsy programming in Theatre Pro Rata’s mission statement. Amber Bjork (left) and Sally Wingert. Photo by Charles Gorrill. The main narrative hinges on Maureen (Amber Bjork)’s relationship with her very cranky and aged mother Mag (Sally Wingert); Ray (Taylor Evans) and Pato (Grant Henderson) flit in and out of frame. Coming after several distinguished performances last season, Wingert’s portrayal is one for the memory books – this is really good stuff, and sometimes a little close to home amidst the laughter. As Maureen, Bjork gives a performance layered with numerous shades of grey. Either depiction done just a little off could be tiring, but with their dynamic the first and second halves pass very quickly. Five points to Gryffindor for the period kitchen put together by set designer Andrea Heilman.